This is a very good looking colour restoration of a 70’s Italian crime film, featuring some wonderful design details, some atmospheric Milan locations (shot in Impressionist style hazy morning light), a soundtrack featuring a heart-aching melody and some Funked-up variations – and a nice performance from the blue-eyed, bag-of-potatoes face lead. 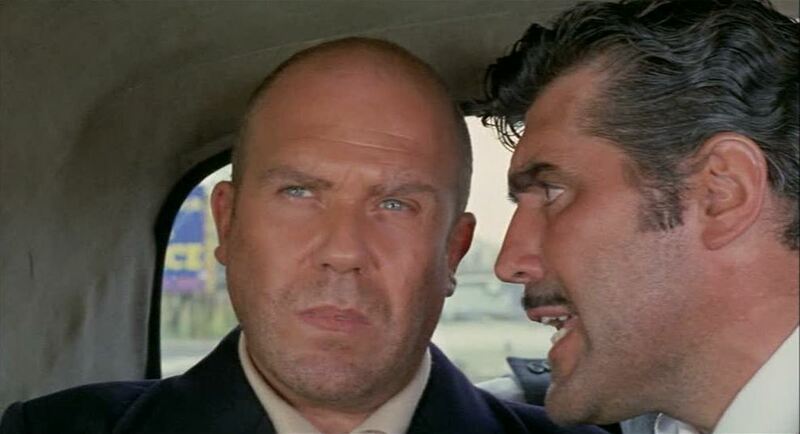 Ugo (Moschin) is paroled after serving three years for the robbery of a money courier. His criminal associates, including the histrionic Rocco (Adorf), want to know what happened to the 300K dollars from the job. Ugo claims he was set up and doesn’t know who heisted the heisters. He’s going straight and just wants to get back with his go-go dancer girlfriend Nelly (Bouchet). But Rocco and his boss, The American (Stander) make Ugo an offer he can’t refuse: work for us and stay alive. The story is pretty good, with the double-crossing denouement flagged up beforehand but never annoyingly obvious. The film works best when it focuses on Ugo, his dilemmas and Moschin’s inscrutable face – these all leave you guessing until the last ten minutes. Both a sub-plot which explores political factions in the Milanese police and the sequences which luxuriate in Rocco’s operatic approach to violence are less controlled, less successful. This is the sort of European film you used to stumble upon on the graveyard shift of 80s and 90s late night/early morning UK tv: the saturated colours, the overwrought minimalist de luxe design elements (for example, Nelly’s apartment – even the glasses are outrageously, needlessly styled), the endless sipping of J&B … back then these created an atmosphere that dropped like a bomb in my colourless, after midnight existence. I’m glad to say that this film at least still seems like an irruption from another time, when cinema concerned itself with evoking seedy milieus and immersing the viewer in them. Milano Calibro 9 is well worth checking out – let’s hope Arrow Video continues to discover, restore and release such genre gems with so many value-adding extras to give context and improve knowledge of the social history of these films.